Now that you have Event Espresso installed, you will need to make sure all the basic settings are in order. These can be tweaked later, but let’s go through them now so that you understand what everything does. 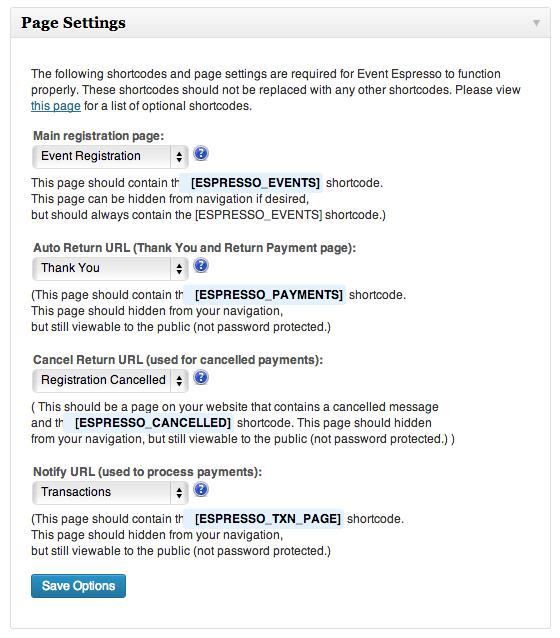 First, log in to WordPress and navigate to Event Espresso > General Settings. In this Getting Started guide we are only going to cover the first two sections. For more detailed information, check out the General Settings documentation. It is important that you fill out this section and make sure the details are correct. These settings tell Event Espresso who you are and will be used again and again throughout the event creation process. Company Logo: add your logo here to enable branding of your invoices, tickets, and payment templates. Contact information – all of your basic contact information. Your organization’s name will appear on all of your correspondence. Make sure you add your organization’s country, as this determines what currency is shown. The email section here is where all notifications will go to, so make sure it’s correct. Please note: By default, you can enter only one email address in this field. If you wish to have more than one primary contact email address entered here, you’ll need to hook into the wp_mail() function so it overrides the “Reply to:” address when sending out notifications from Event Espresso. Time & Date – choose the correct time zone to ensure that your event registrations open and close at the correct time. Please do not use UTC time. Please find the closest city to where you are, otherwise some aspects of the plugin will not work. Make sure your time is set to the closest city to your location. If you leave the time as the default UTC setting, some parts of Event Espresso may not function correctly. There are a number of pages that you need to have for Event Espresso to function correctly. When the plugin is installed, it creates 4 default pages for you to use. All of these can be excluded from your website navigation. If you are using a WordPress 3.0+ theme with navigation support then you can do this by omitting the pages from the menu you create at Appearance > Menu. If your theme does not have nav menu support you can use the Exclude Pages from Navigation plugin. Main Registration page – the plugin will create a page called Event Registration which will contain the [ESPRESSO_EVENTS] shortcode and will display your events as well as process the registrations. Auto Return URL – the plugin creates a page called Thank You. This is where the user is sent to when they have completed the signup process. It will have the [ESPRESSO_PAYMENTS] shortcode on it and must be publicly viewable. Cancel Return URL – the plugin creates a page called Registration Cancelled, and this is where a user is sent when a payment is cancelled. It can also be used to clear the session or cart when using the Multi Event Registration add-on. It will have the [ESPRESSO_CANCELLED] shortcode on it. Notify URL – a page called Transactions is created. It is used behind the scenes to process the payments. It will have the [ESPRESSO_TXN_PAGE] shortcode on it. If you navigate your browser to this page, it will display a message that says “An error occurred. No ID or an invalid ID was supplied.” This indicates it is set up correctly. The four pages listed above need to be published publicly if you are using a payment gateway to collect payments. They should not be set to Private or set to Password protected. The Main Registration page can be in your navigation (or not) if you wish. The other pages MUST NOT be in your navigation menu. The page settings let you adjust these pages. If you change one of the default pages, then you must insert the corresponding shortcode into the page. So, for example, if you change the Main Registration page to My Events, you must insert the [ESPRESSO_EVENTS] shortcode on the My Events page, with nothing else there. OK, now it’s time to move onto the next step, Payment Settings, and return to the optional settings at a later date.